Experience the famous Ramayana Trail in Sri Lanka. Visit the sacred shrines and monuments distributed along the Paradise Island. Visit the ancient cities of Dambulla and Kandy and famous Kovil at Trincomalee, Koneshwaram. Pinnawala Elephant Orphanage is the home for young Elephants who have been displaced or lost from their natural habitat, located at Pinnawala village in Sabaragamuwa province of Sri Lanka. Pinnawela Elephant Orphanage is the best place for an up close and personal experience with the world’s largest land mammals! Visit the Pigeon Island National Park consisting of the smaller pigeon island and larger pigeon island and the coral reef that encircles the larger island. See the rock pigeon that makes the island its breeding grounds. Explore the islands to see the many coral types and fauna that can be found here. Nilaveli Beach is one of the most tourist attraction beach in Sri Lanka, located about 16 km North-West of Trincomalee. Nilaveli is ideal place for water sports like scuba diving. Do a guided tour of a spice and herbal garden, where you learn about spices, such as coriander, chili, cinnamon, cardamom, and nutmeg; and their uses. Take part in a traditional cooking demonstration that shows you how to make Sri Lankan cuisine while making full use of spices. Learn to make roti or create curry powder from scratch in one of the workshops. Go on technical tours related to arts such as gem crafting, woodcarving and batiks. And watch the Kandyan Cultural Show with its colorful traditional dances and delightful music. Ramboda Falls is the 11th highest waterfall in Sri Lanka and located by the Pussellawa. 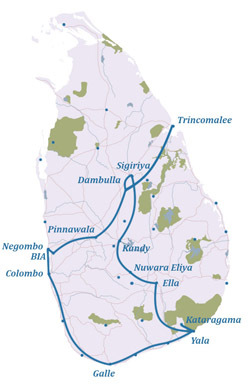 Ramboda falls consists of three sections. You will get a good view of the middle section of the A5 highway, just above the bridge. This is very small in size with compared to other parts. You can get a far view of the top part from the main road, but not the complete view of the fall. You need to climb up to see the top part of the Ramboda falls and there is a pathway just before the bridge. You may find the climbing bit difficult, but you will be compensated with the great view of the top fall and the surrounding. Visit the beautiful, scenic, cloud-kissed forests and grasslands of Horton Plains National Park in Ohiya, Enjoy the majestic views from the precipice of World’s End and the cooling sprays from Baker’s Falls. Catch glimpses of the many endemic faunae that make their home in the plains. Get to know more about the archaeological finds that were discovered in the area. Nuwara Eliya is set in the heart of tea-country is a beautiful town where the British succeeded in creating a replica of the English countryside, with homes in styles from Georgian to Queen Anne.Well-kept lawns with hedges, an Anglican church, a famous golf course and beautiful parks give the place an air of nostalgia. Situated 6,200 feet above sea level, the air is cool and fresh – a serene retreat from the hustle and bustle of the city life.